If you should be so adventurous as to visit the Arctic regions at the top of the world, you might have occasion to meet up with Nanuk. And if you do, you’ll want to mind your manners. Now you might be asking yourself, “Who is Nanuk?” but the correct question is “What is Nanuk?” Nanuk is the Inuit name for a Polar Bear. The Inuit Indians considered Nanuk to be wise, powerful and “almost a man.” The Inuit had seen polar bears walking upright just like a man and their legends told of polar-bear men that lived in igloos where they secretly shed their furry skins and spoke like humans. 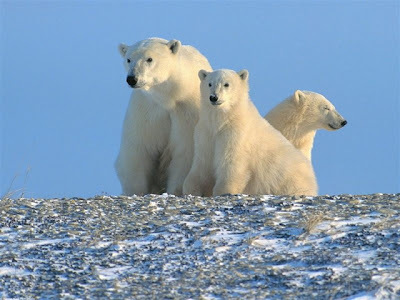 While polar bears may not live in igloos, they do shed all their old fur and replace it with new fur. This process called molting, happens every year, usually in May or June. 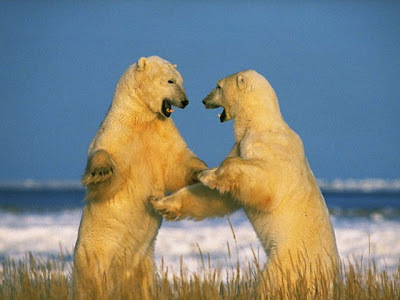 As to speaking, polar bears have no need to talk like us. They have their own language expressed through body movements and grunts and growls. When he wants to play, a little polar bear cub lets his friends know by wagging his head from side to side. A playful adult stands on his hind legs with his chin lowered to his chest and his front paws hanging by his side with a “Won’t you come and play with me?” kind of look. 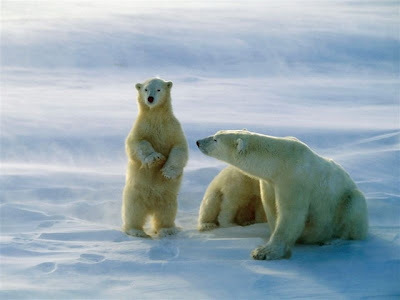 By the way when an adult polar bear stands up, he can stretch 10 feet, the same height as a one-story building. Angry bears roar and growl. And watch out if they hiss and snort or lower their heads. That means they are about to attack. Polar bears are clever hunters and seals are their primary prey. When seals swim under the frozen surface of the arctic, they have to come up for air every 10 to 15 minutes. With the sharp claws on their front flippers they carve as many as 15 or more air holes in the ice that they can use whenever they need to. With its acute sense of smell, a polar bear can easily locate either a seal or one of the many air holes it has created. The clever polar bear doesn’t have to hunt or chase its prey. It simply waits patiently next to a hole for a seal to surface. And patience is a necessary virtue because the seals have made so many breathing holes in the ice that it could take hours or even days for the seal to reappear at that exact hole. When stalking a seal on top of the ice, the polar bear places each 12 inch wide paw carefully on the snow so as not to make a crunching sound that would alert its prey. If the seal raises its head, the polar bear freezes in its tracks, almost invisible against the ice and snow. When the seal relaxes, the bear resumes its advance. 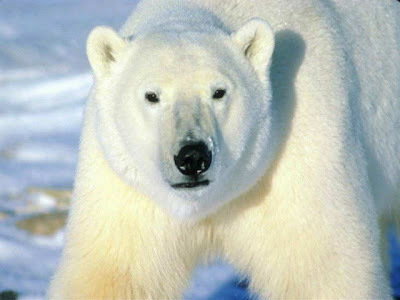 The largest predator on land, male polar bears weigh up to 1500 pounds and females weigh in at 550 pounds! How does anything that heavy walk on ice? For starters, polar bears have extra big paws that measure 12 inches across. The huge paws are like snowshoes that help distribute the bear’s weight over a large area, making it easier for them to walk on the thin ice. Soft bumps on the bottom of each paw grip the ice and keep the bear from slipping while his sharp strong claws can provide traction. Second, when the bear senses that the ice is very thin, it crawls on its belly, spreading its weight out even more so that it won’t break through the ice. And third, polar bears are excellent swimmers. Their large forepaws make great paddles and their strong hind legs easily propel them through the water. A little misstep simply means a chilly dunking. 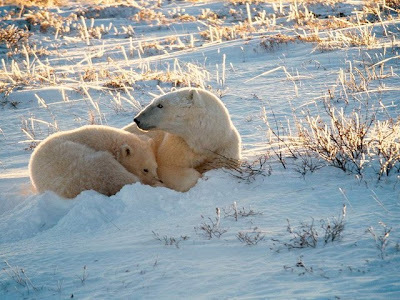 Wet or dry, polar bears stay warm in the subzero temperatures of the arctic with several layers of padding. Under their thick, warm, and water repellant coat of fur is a tough black hide that absorbs heat and a layer of blubber that can be 4 inches thick! They are so well insulated that there is almost no heat loss. In fact, there is so little heat loss that a polar bear will not show on an infrared photograph. (Infrared film measures heat.) The only part of a polar bear that can be seen on infrared film is the puff caused by the polar bear’s breath! All that insulation means that polar bears can easily overheat. That’s why even though they run in short spurts to catch prey, polar bears prefer a leisurely pace and would much rather do their hunting by lying in wait next to an air hole, keeping cool on the ice. Polar bears are not only strong and clever; they are also well mannered and well groomed. Even though one bear may have done the hunting, he will share with other bears if asked politely. To join in the meal, a bear must approach the “owner” in a submissive, low to the ground position and slowly circle the carcass. 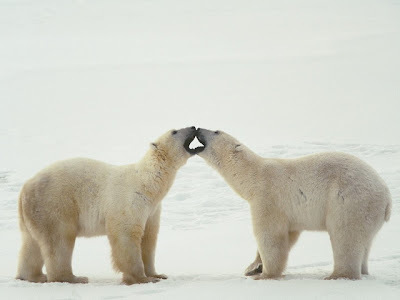 Then the bears must greet each other by touching noses. Once this is accomplished they can eat together. When everyone has had their fill, the bears wash up. If it is summer they will head for a pool of water. In the winter, snow is the only choice. The bear will rub its head in the snow, push forward on its tummy, and then roll onto its back to be sure to be clean all over. Summer or winter, the bears will continue to groom themselves by licking their paws, chest, and muzzle. They check their paws and remove uncomfortable chunks of ice from between their clawed toes. And if her cubs aren’t washing behind their ears, a mother bear might softly cuff them with her big paw as a “gentle” reminder. So if your adventures bring you into polar bear country, remember your table manners when you meet Nanuk and be sure to wash thoroughly if you don’t want a “gentle” reminder.